Lewis and McCain traded tough statements Saturday. Lewis issued his statement after several days of headline-grabbing anger directed at Democratic nominee Barack Obama by some attendees at McCain campaign rallies. "What I am seeing reminds me too much of another destructive period in American history. Sen. McCain and Gov. [Sarah] Palin are sowing the seeds of hatred and division, and there is no need for this hostility in our political discourse," Lewis said in a statement. "George Wallace never threw a bomb. He never fired a gun, but he created the climate and the conditions that encouraged vicious attacks against innocent Americans who were simply trying to exercise their constitutional rights. Because of this atmosphere of hate, four little girls were killed on Sunday morning when a church was bombed in Birmingham, Alabama," wrote the Democrat. McCain has written about Lewis, praising his actions at Selma during the civil rights movement. The Republican nominee even said during a summer faith forum that Lewis was one of three men he would turn to for counsel as president. But the Arizona senator blasted the congressman’s remarks, and called on Obama to repudiate them. "Congressman John Lewis' comments represent a character attack against Governor Sarah Palin and me that is shocking and beyond the pale,” he said in a Saturday afternoon statement released by his campaign. “The notion that legitimate criticism of Senator Obama's record and positions could be compared to Governor George Wallace, his segregationist policies and the violence he provoked is unacceptable and has no place in this campaign. I am saddened that John Lewis, a man I've always admired, would make such a brazen and baseless attack on my character and the character of the thousands of hardworking Americans who come to our events to cheer for the kind of reform that will put America on the right track. "I call on Senator Obama to immediately and personally repudiate these outrageous and divisive comments that are so clearly designed to shut down debate 24 days before the election. Our country must return to the important debate about the path forward for America." McCain himself seemed to be looking to calm frustrated Republicans Friday, telling supporters at a campaign rally that the Democratic nominee was a "good man," and that they had nothing to fear from an Obama presidency. Update: Obama's campaign said he did not agree with the comparison made by Lewis - but did not repudiate the congressman's remarks. "As Barack Obama has said himself, the last thing we need from either party is the kind of angry, divisive rhetoric that tears us apart at a time of crisis when we desperately need to come together. That is the kind of campaign Senator Obama will continue to run in the weeks ahead." Does it matter who said what now? I could not stand sending Hillary Clinton back to the White House and neither can I see a Democrat in the White House to help a Dem-controlled Congress drag us into more trouble after the 700-billion bailout. I am with President George Washington. Partisan politics is no good. McCain and Caribou Barbie have been telling lies and inciting hatred because they don't have anything substantive to talk about. The Republican crowds can protest all they want that they're not covert racists but everyone knows the truth. Not only should Sen Obama not repudiate Rep Lewis (A man whose opinions McCain says he respects), But more people need to point out McCain has no clothes and Palin is far too stupid to have any authority in America. ( Even dumber than W ). I am concerned for the safety of Sen Obama, if anything that happens it will be completely Sen McCain and Palins fault. Obama has to say NOTHING! The McCain campaign has become an incredible cesspool. to many people believe that in todays' society, blacks, whites or all america will stand for this non-sense. slavery days are over and the Karl Rove fear tactics want work this time. My only comment is to tell folks that when, not if this thing finally blow, be prepared to defend yourself and stand up for what is right. According to mulitple news sources, the economy crisis were caused by lending to blacks and minorities (what ever). Bottom line McCain, if this thing turns into a war, we will have you and your pitbull soccermom to thank. remember George Wallace sicked the dogs on blacks (us), this time it will be diffrent. This is 2008 NOT 1960. Time to turn the page and look for a better tomorrow.. America are you ready? The whole world is watching us how we conduct ourselves. Actually leaders of the KKK have stated they want Obama to win, their numbers have gone down because more people are tolerant or don't care about color these days, and the KKK thinks Obama and people upset with the direction of the nation will increase their numbers. Obviously, they don't have to wait that long with McCain/Palin inciting hatred wherever they can. The republican party has failed with Bush/McCain. Now McCain/Palin and they have added Cindy to the mix are just trying to add hatered and division to the already angry and hurting American people. Please McCain go to your retirement while people still think kindly of you. 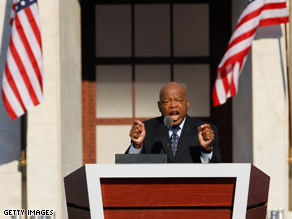 Why in the world would Sen. Obama repudiate the TRUTH that Rep. John Lewis has stated. What McCain and Palin need to do is apology to Sen. Obama and ALL of the America people for their hate-filled remarks and for wasting time in this election, turning the page from the economy, and turning to their old stale and dirty politics of fear, hatred, and division ! McCain-Palin's campaign is in the toilet. The question now is how will they exit – as someone who tried to focus on the economic wows with real solutions, or as someone who spent all of their time in negativity and divisions. I wonder which one will they choose. I truly hope everyone will turn the page on this old dirty stale politics, and choose a better path. It's time for the American people to get it right and NOT vote for McCain-Palin, instead vote for change. It's time for this country to turn the page and seek a new and better future for ourselves and our children.It's time for REAL change in Washington, it's time to elect Barack Obama for president ! Obama-Biden are the wiser and stronger team to solve the crucial challenges we have in this nation and abroad ! McCain needs to take a good long look at what he's doing. He's encouraging all this mess with his "pitbull" VP up to her winking eyes in hate and racism. If someone shoots and kills Obama a good deal of the blame will land at the feet of McCain and Palin for inciting all this mess.